Original article: "Mersu oli sotakone sarjatuotannon ehdoilla"
The light fighter Messerschmitt Bf109 was the most important aeroplane of Adolf Hitler. It has been produced more than any other fighter. Hannu Valtonen made his PhD of the two planes displayed in Central Finland Aviation Museum. Fighter pilot, Ltn. Colonel (retired) Hannu Valtonen hasn't flown the Messerschmitt, but it has occupied his thoughts already from 1949. Daddy took then 7-year-old Hannu to former "Bio Olavi" of Savonlinna to see a film about the atrocities done by Nazis. His Messerschmitt-hobby reached its' zenith on spring 2006, when he completed his PhD about the two Bf109s residing in the Central Finland Aviation Museum. The PhD work was the first in Finland in the field of museumlogy. There is 15 planes left in the world of the 36000 produced. Earlier Valtonen has written a book about the planetype, and he was the director of the Central Finland Aviation Museum from 1980 to 2003. One can't say that a flying Messerschmitt would be an elite plane of the highest quality and durability. On the contrary. The Third Reich's Ministry of Aviation (Reichsluftfahrtministerium) gave to the desiger, Messerschmitt AG, the task of producing a cheap and easily produceable warplane. There was requirements for the new plane: it had to be able to take off from a 600m long airstrip and to climb to 6km in seven minutes. The required top speed at the altitude should be at least 400km/h and the flight time with full throttle one and half hours. -The fighter was meant for an offensive war, where the losses are high. The structure of the plane is designed without any additional strenght margins, therefore for example landings had to be done carefully, says Valtonen. 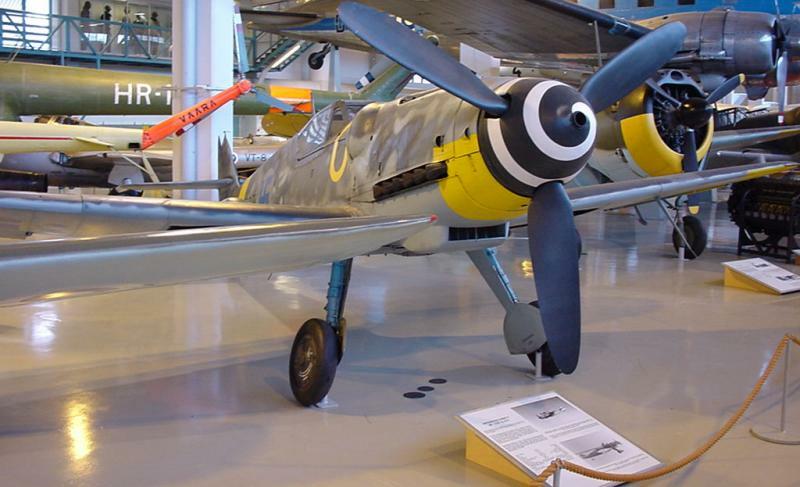 The engine for the Messerschimitt was designed for only 200 hours of flying. At 100 hours a full overhaul was made. The promised flight time for the fuselage was 450 hours, which was in practise clearly overoptimistic. Already after 50 hours of flight the structure of the aeroplane was so stretched and tired that the topspeed was reduced by 50 km/h. In practise the fuselage could be flown up to 300 hours. According to the studies of Valtonen, in average under ten flights was done per aeroplane in combat situation. Hundreds of planes were destroyed also outside of combat, Messerschmitt required care with take-offs and landings. 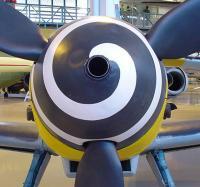 The speciality of the wing of the Messerschmitt is the main spar that is placed clearly after the thickest part. Best place for the spar would be at the middle regrading the rigidity of the wing, but then the landing gear wouldn't have enough space to turn inside the wing. Price for this structural compromise was a wing that was too flexible. Therefore the greatest divespeed was limited to only 100km/h higher than the maximum speed of the plane. Many pilots regarded this limitation as totally senseless. 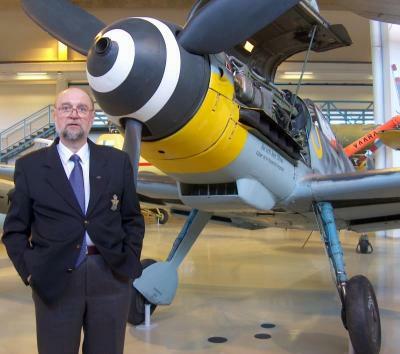 PhD of the "Messerschmitt Bf109" Hannu Valtonen. "Messerschmitt was at it's best between 5 and 8km of altitude, if only you could get the opponent to come there." Of the wartime pilots who Valtonen has interviewd, some liked Messerschmitt a lot, some remembered mostly the bad points. Only thing all thought highly of was the engine power. The engine is a liquid cooled inverted V12 ie. A12. Engine displacement is 35,7 litres and maximum power is 1475 hp. In a tight spot the power could be increased temporarily by injecting water-methanol mix into the charger, this could be done when flying under 5700m. Above that nitrous oxide was used, also known as "laughing gas"(or just NO2). Water-methanol improved the filling and cooling of the cylinders. Nitrous oxide gave more oxide to the engine. At the start of the Second World War the Messerschmitt was the best fighter of the world. As a result of continuous development it stayed combatworthy to the end, although being surpassed in performance to the new allied planes. -The safety characteristics of the engine are in many aspects such that nowadays it wouldn't be allowed to fly, says Valtonen. Basic armament of the Messerschmitt is the 20mm cannon that shoots through the gearbox and propellor hub and two 13mm machineguns that shoot through the propellor arc. Sometimes they shot holes to the propellor blades when syncronisation failed. For his PhD work Valtonen gathered extensive background material of the two planes in question. He f.ex. asked impressions of the pilots who had flown plane and combed through the war archives of the Germany for months. The Finnish Air Force had at its' disposal all in all 164 Messerschmitts. 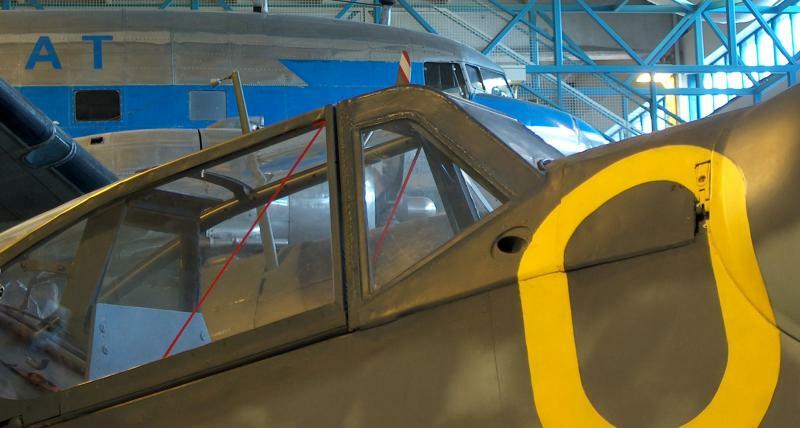 According to the study of Hannu Valtonen the fuselages and wings for these two planes were manufactured at concentration camps Gusen I and II. In these camps between February 1944 and the June of the next year 14131 prisoners doing subcontractor work for Messerschmitt. Investigating the backgrounds of the planes increased substantly the historical value of the planes in Tikkakoski museum. -The purpose of an item in museum is to tell about its' own time. Therefore those items should not be restored to a new-like condition, but with preventive restauration to keep them in their current condition, says Valtonen. According to the closing words of the PhD work, the displayed Messerschmitt Bf109s are "an evidence of humanity's best technical innovations, skills and education levels and on the other hand, of the humanity's darkest side with wars and concentration camps". 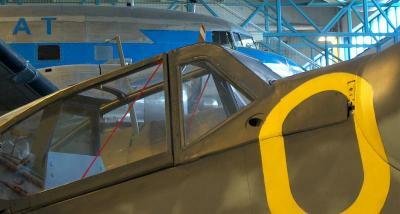 Messerschmitt and Dakota, both enjoying of the peace offered by Finnish Air Force Museum.